Receive leadership tips right to your email inbox. Click to sign up now! Follow us on social media for the latest from OASC! OASC doesn’t want to leave you behind! Sign up for our email list and we’ll make sure you’re informed about conferences, camps, and our latest leadership lessons! The Oregon Association of Student Councils is a non-profit member association, serving middle and high schools throughout the state. We provide leadership development to both students and advisers. 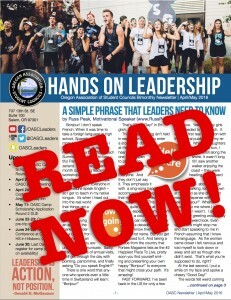 Our program is sponsored by the Confederation of Oregon School Administrators (COSA), and we are recognized by theNational Association of Student Councils (NASC). Check out what’s next on the OASC Calendar! Plan your leadership year today! Being a member of OASC means your school has unlimited access to OASC Content! Are you looking for pictures from a past conference or camp? Check them out here! Calling alums of OASC! Find out ways to network and volunteer on the Alumni page. Give the gift of OASC! Donate and share the opportunity with others. OASC has lots of books and resources for leadership groups. Check it out.